If you love the feel of chilly mountain air ripping through your hair, if you love the gush of adrenaline in your bloods and if you love to have fun, then you'll love to be in Auli. Large slopes covered with seasonal snow become an ideal place for skiing in the winter months. One can feel the adrenaline levels rising as one negotiates the challenges of the steep gradients and traverses unimaginable distance. Quite truly, the thrill of skiing, remains unparalleled. As the elements are defeated exhilaration swells up. In skiing, the use of only the simplest forms of implements adds to the adventure. The breathtakingly beautiful mountain resort of Auli is cradled in the lap of the snowcapped peaks of Garhwal Himalayas in the Chamoli district. It is situated close to the holy shrine of Badrinath. Auli is located at an altitude of 2500-3050 meters above sea level, and offers a panoramic view of Mt. Nanda Devi, mana Parvat, Dunagiri, Beethartoli, Neelkanth, Hathi Parbat and Komet. The potential of Auli was adjudged by French and Austrian experts under the aegis of the Government of Uttar Pradesh. With their wide open spaces above the snowline, Auli offer yet another exciting possibility - skitouring amongst the glaciers. 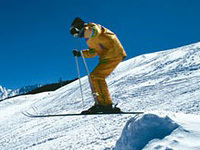 For the avid skier, cross-country runs of 10-20 kms. are now available, with the added advantage of fresh powder snow, away from crisscrossing streams of skiers that overtake the slopes of the European Alps. A state-of-the art Ski lift which has been imported from France. The Ski lift is 500 meters long which makes it the longest in the country. The slopes of Auli also have luxury of an 800 m long chair lift linking the lower slopes with upper slopes. There are two snow-beaters imported from Germany. 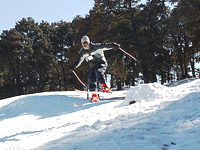 Dressed and improved ski slopes which make the slopes of Auli ideal for hosting skiing festivals and competitions. A 3.9 kms. long ropeway links Joshimath with the upper slopes of Auli. It covers a track distance of 4.15 kms. and is the longest ropeway in Asia in zig back system. 6-day Non-Certificate Course at Auli. Package Includes Dlx. Accommodation & all Meals. 3 day Non-Certificate Course at Auli. One Day Willd Life Safari. Half-Day Rafting at River Ganges. Lunch During Rafting and Wild-Life Safari.